Windows RT just can't catch a break. Friday's big news— Apple's refusal to create an iTunes Windows 8 app —was another blow to the beleaguered OS, for even though Microsoft's finger-friendly programs are dubbed "Windows 8 apps," they're truly "Windows RT apps." The ARM processors powering Windows RT tablets can't run traditional desktop programs (like iTunes) and are instead forced to rely upon the lackluster selection in the Windows Store. Apple's decision to pass on a Windows 8 app doesn't affect hardware running the full version of Windows 8 in the slightest, as those users just grab the classic version. 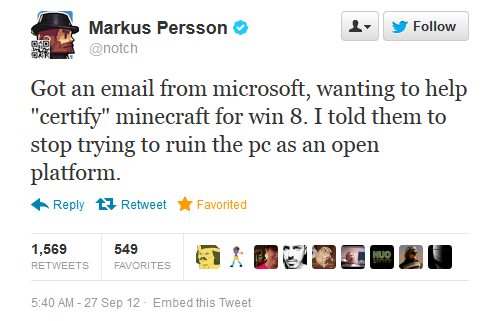 But for people who bought into the promise of the Surface RT and its ilk, the snub cuts deep. 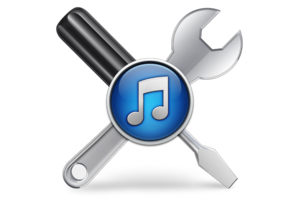 More important, iTunes is a juggernaut of an ecosystem, gobbling roughly two-thirds of all paid digital music and video sales alike. If you buy digital media, there's a great chance you have something stashed in iTunes—and, if that something includes any video files or DRM-protected songs, you'll find it utterly inaccessible on Windows RT. Apple's cold shoulder isn't a death blow, but it is yet another nail in Windows RT's coffin. Nobody is lining up to support Windows RT. Nobody. The Windows Store has been slow to grow and plagued by prominent no-shows. 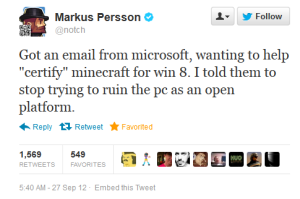 Big-name game publishers like Blizzard, Valve, and Minecraft's Markus Persson have called Windows 8's closed app store a "catastrophe for everyone," to use the words of Valve's Gabe Newell. Analysts are openly calling for Windows RT to change or die. Meanwhile, even Microsoft's staunch manufacturing allies are turning their backs on Windows RT. HP and Toshiba took a pass before the operating system even launched. Samsung squashed plans to bring its own ATIV Tab stateside, saying "There wasn't really a very clear positioning of what Windows RT meant in the marketplace." Acer president Jim Wong landed an even stiffer gut punch just last week, when he told PCWorld that the company had decided to cancel its own plans for a Windows RT tablet until the Windows Blue update comes out. "To be honest, there’s no value doing the current version of RT," Wong said. The Asus VivoTab, one of the few Windows RT hybrid tablets available. With so many cards stacked against Windows RT, it shouldn't surprise you to hear that slates bearing the bleh operating system aren't exactly selling like hotcakes. While the Surface RT tablet is the usage leader for all Windows 8/RT devices, no doubt due to its high visibility in the early days of Windows 8, recent numbers suggest that just 200,000 Windows RT slates shipped in the first quarter of 2013. That's bad—real bad. Meanwhile, Intel's Clover Trail tablet processors have slowly been eating away at the battery life advantages long enjoyed by ARM chips, offering the full capabilities in long-lasting form—and the company's upcoming Atom chips promise even better power efficiency and performance. Nope, things aren't looking good for Windows RT. And Apple just added to the pigpile. Calling the iTunes diss "another nail in the coffin" might be a bit harsh, though. Windows RT isn't going to die anytime soon, because like a parasite, it can lie dormant and grow fat on Windows 8's eventual success. As I've argued before, even if growth has stalled for the PC industry, hundreds of millions of Windows PCs continue to sell year-in and year-out. Eventually, the operating system will have a massive installed base, and with a great user base comes great developer interest. Big-name apps like Twitter and MLB.tv are already starting to show up in the Windows Store with increasing regularity—and those Windows 8 apps run just fine on Windows RT tablet, too. And on that distant, golden day, when Windows RT fulfills its promise, Microsoft might just go ahead and kill the desktop completely. But only if Windows RT survives long enough to get there.